The image of the Nativity scene, and the detail of the angel from it which accompanies one of the Christmas posts (The Gift), are from Giotto’s fresco cycle in the Scrovegni Chapel (or Arena Chapel) in Padua. These images were chosen not just for their appropriateness to the time of year, but also because the Scrovegni had a particular significance for Sophia. The Scrovegni is an artistic gem. It is one of the loveliest works of art in a country filled with lovely things. Padua was bombed during the war, and what is left of the historical section is small (it’s there, but you have to look for it). Most tourists therefore tend to pass Padua by, heading straight for the splendours of Venice, Florence, and Rome. Far fewer tourists stop to see the Scrovegni, and so miss a truly exquisite work of the human imagination. We were fortunate. Living in the nearby Euganean Hills when Sophia was 4, we went to Padua often, and saw the Chapel many times. This period was one of the most important in her life, and the Scrovegni had a crucial role to play in it. Made for a wealthy Paduan family, the Scrovegni Chapel arguably represents the high point of Giotto’s career. 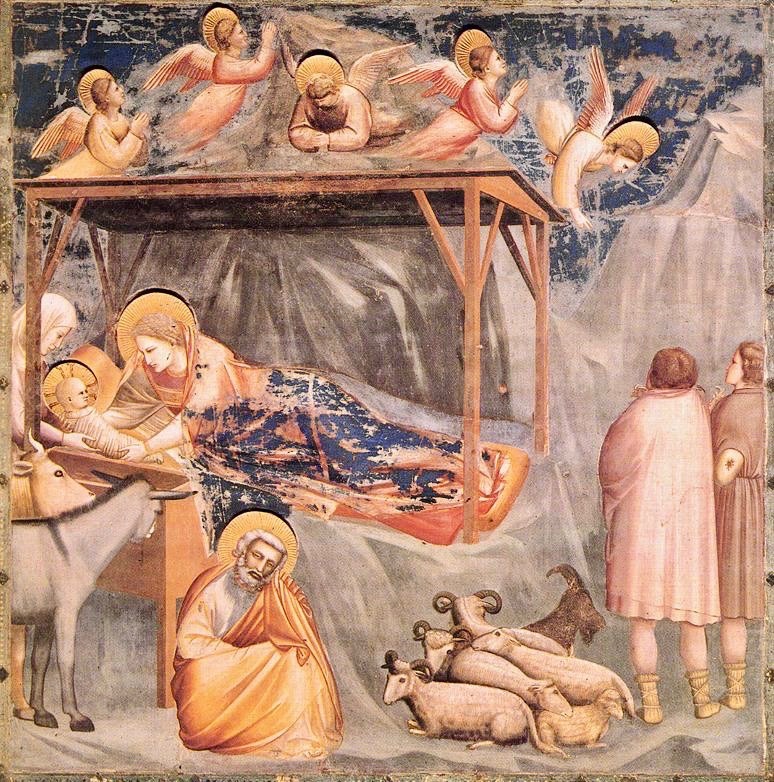 Giotto was one of the great artistic innovators. Long before the breakthroughs of the High Renaissance (his fresco cycle in the Scrovegni was completed in 1305), Giotto shook up the art world by bringing a deeply human quality, an intense psychological awareness, to his work. His work is about people—people who lived and died and loved and suffered. It tells their stories. The story the Chapel tells is the Christian story. One sequence depicts (through an unfolding series of panels) the life of the Virgin Mary; the other, that of Jesus himself. A vast Day of Judgement occupies the wall over the entrance. Individually, every panel is compelling. Seen as a whole, the Chapel is breathtaking. However, it is also strangely intimate. It is a chapel, not a church. The dimensions are small. When we saw it, each time, we were almost alone within it, only a handful of others there with us. Moreover, as there were, at that time, no barriers, we were literally within a hands breadth of it. This was art up close. It was as real as it could possibly be. It was certainly real to Sophia. The Scrovegni Chapel had an enormous influence on her. The creative interaction between art, religion, and history which was to have such a formative role in her intellectual development, began here in the meeting across time of the fourteenth-century Giotto and the enquiring mind of this little four-year-old at the tail end of twentieth century. There is actually a condition called Stendahl Syndrome (after the French writer) in which people experience physiological symptoms (dizziness, disorientation) in response to seeing Italian art. They are overwhelmed by the experience. Sophia was never overwhelmed by what she saw. She loved art with a passion—it was never “too much” for her. However, it did change her forever. Sophie experienced a huge leap in knowledge and understanding during that first trip to Italy. It transformed the way she saw the world. Her mind was working at a furious pace, seeking to integrate all the impressions and information she received. It was one of the most seminal periods of her life. And the Scrovegni was at the heart of it. Little Sophia filled pages and pages with drawings of scenes from the Christian story. I used to joke (somewhat nonplussed) that she was the only 4-year-old I’d ever come across who could, for example, tell you the difference between an Annunciation and an Assumption, detailing all the various iconographic attributes. Four-year-old Sophia intuitively understood that art is about meaning. She saw in Giotto’s frescoes precisely that portal between physical and transcendent realities which she was in later years to conceptualise as art’s profound purpose, seeking as the greatest art does to reach beyond the limits of our understanding, to speak (contra Wittgenstein) into the vast silence. In the Nativity scene, suspended at the moment of transition between worlds, held at the point of tension between sacred and earthly realms, Giotto’s lovely angels are the very embodiment of it. The Scrovegni, Sophie would tell you, is too beautiful and too important to leave unseen. We might not be able to take ourselves off to Padua, but one of the amazing gifts of this digital age is that we can bring Padua to us. Here are links to websites where you can see the Scrovegni Chapel for yourself. Some part of Sophia, in her love for it, will be there too.